Changing the Hook, Creates A Different Look! 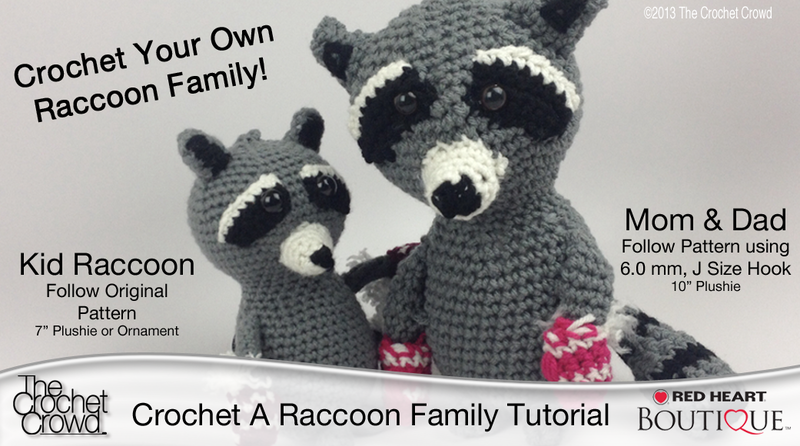 Enjoy making a fun loving Crochet Raccoon Family for Christmas. The original pattern is for a 7″ Ornament. Simply change the hook size and follow the pattern again using a 6.0 mm or J size hook, you will have Mom & Dad size 10″ versions. It’s super adorable for making a winter scene or even giving them away as a special gift. Though the pattern instructions are very detailed, the pattern is really well written and super easy to follow along. I give the designer a lot of credit for her thoroughness. A video tutorial is included and is the biggest tutorial in detail ever produced by Mikey.